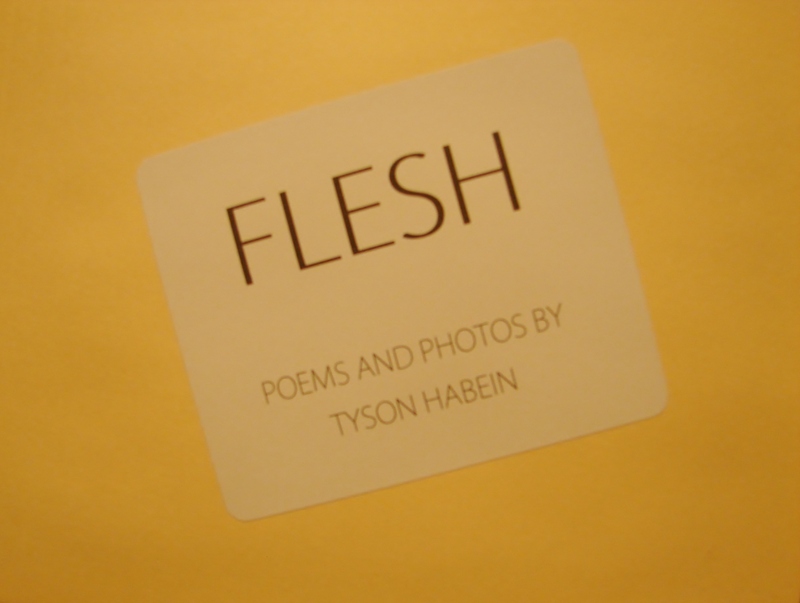 Today at Persephone Magazine, you can win your very own copy of FLESH: Poems and Photos by Tyson Habein. Click on through and check it out, along with the other giveaways the site has going on for their fourth birthday. ALSO: If you live in Great Falls, Nouveau Nostalgia author Saif Alsaegh will be reading from his book, Iraqi Headaches, on November 1st at the public library. We hope to see you there. This entry was posted in Appearances, Books and tagged books, Flesh, giveaway, Persephone Magazine, poetry, Saif Alsaegh, Tyson Habein. This entry was posted in Books and tagged books, Flesh, giveaway, goodreads, Tyson Habein. FLESH: Poems and Photos by Tyson Habein is now available! To order, please click on the image that corresponds to where you live, and we’ll mail you this lovely handmade book. We’re really pleased with how it turned out, and we hope you like it. More about FLESH: This book is a collection of poems paired with black and white photography that delves into longing and lust within the intimate moments of our lives. What’s unusual about it is that the order of the poems and photos is entirely up to you: There are 10 poems printed on individual index cards and 10 photographic prints, each in their own envelope attached to the book’s cover. The cover arrives tied with a red string, as though you have purchased an illicit package that you must unwrap and discover on your own terms. Just a reminder – Because payments are processed through PayPal, please make sure your name and address information are current. And, of course, that you’re clicking on the right purchasing link for your country. If you have any questions, email sarahabein AT gmail DOT com. Keep in mind that each book is handmade, and so there are slight variations with every book. You can also add the book to your Goodreads shelves. If you’re interested in Tyson’s further thoughts on the book, you can read interviews with him at Big Sky State Buzz and the Great Falls Tribune. This entry was posted in Books and tagged art, books, cover, Flesh, goodreads, handmade, interview, new releases, photography, poetry, Tyson Habein, unbound. As you can see, we have a bit of a gap in our schedule, but we have no official Portland event scheduled. We know that the 20th is Easter Sunday, but if anyone out there is interested in hosting an event on either April 19th or 20th, do send us a message. Speaking of Portland, Iraqi Headaches is now also available at Powell’s City of Books. Even better, it’s on sale for the entire month of April, so if you’re loading up over there already, do give it a look. In Great Falls, MT: The book is also available at Hastings. HOWEVER! The only way to get the Deluxe Edition with the hand-painted slipcover is to order either directly through this site, or to come to one of our readings. Only 100 will be available, and we’ve already sold a fair amount. Come on, be fancy and come to a reading. Also at these readings, we’ll have the last remaining copies of Infinite Disposable by Sara and Tyson Habein, our previous title (one limited to an edition of 100). See you there? See you there. This entry was posted in Appearances and tagged book tour, Infinite Disposable, Iraqi Headaches, Missoula, Montana, Saif Alsaegh, Sara Habein, Seattle, Spokane, Tyson Habein, Washington. Today is the day! Iraqi Headaches: Poems by Saif Alsaegh is officially available to the world – $10 for the deluxe edtion, $8 for the standard. We are only releasing 100 deluxe edition books, and the only way to get one is to order directly from us, or to buy one at any future readings. Deluxe books come with a handmade, hand-painted slipcover, and each one is a little bit different. Once they are gone, they’re gone. Not to worry though, the standard edition is also lovely. Payments are through Paypal, so please make sure your shipping information is correct in your Paypal profile. Please click the correct button for your purchase: U.S.-based shoppers, Canadian shoppers, and all other International shoppers. This ensures you are paying the proper postage for your book. Thank you! We will notify you using the email provided through Paypal that your book has shipped. If you need this confirmation sent to a different email, please provide it in the “Note to Seller” section. If you are purchasing more than one book at the same time, please contact editor Sara Habein at sarahabein [at] gmail [dot] com. We will combine shipping costs and send you the correct Paypal link for your purchase. We apologize for the added step, but we’re a tiny publisher, and so our ordering/payment system is fairly basic. Thank you for understanding. Now, then: Here are your present options for ordering Iraqi Headaches! Thanks for reading! Also, the standard edition of Iraqi Headaches is available at Amazon. While we of course encourage you to buy directly from us (and it is the only way to get the deluxe version of the book), we understand that sometimes Amazon’s more convenient payment options can decide where/when you purchase items. We are also working on having the book for sale at independent bookstores, and when we have those details, we will certainly share them. No matter where you buy the book, we encourage you to leave a review on Amazon and Goodreads! Once again, if you have any questions, email editor Sara Habein: sarahabein [at] gmail [dot] com. Thank you! This entry was posted in Books and tagged books, Iraqi Headaches, new releases, poems, poetry, Saif Alsaegh. 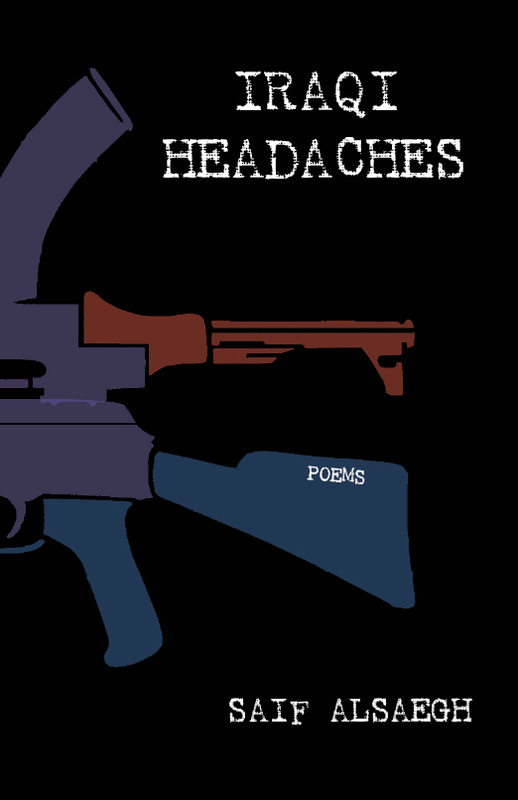 Iraqi Headaches : Poems by Saif Alsaegh comes out on December 17th, but you can pre-order the book now. The special edition of the book that includes a handmade slipcover can only be purchased through us directly here, or in person at a reading. Any other venues in which we might sell the books will only carry the standard edition. INDIEGOGO SUPPORTERS : Not to worry, you are already ordered and you do not need to order again (Unless you want to!). By contributing the the campaign, you saved yourself shipping costs. Thanks again! Now, then: Here are your present options for pre-ordering Iraqi Headaches! Thanks for reading! This entry was posted in Books and tagged books, Iraqi Headaches, poetry, pre-order, Saif Alsaegh.